As any honest churchgoer will attest, the most rewarding part of a service often comes at the end in the form of fellowship hour, when worshippers drink coffee and eat cookies together while recovering from that morning’s sermon. Traditionally — the Bible may require it, for all I know — coffee hour is held downstairs in a parish hall. So imagine my surprise, and then secret delight, when we worshipped at the Church of the Holy Spirit on Easter Sunday with our daughter, Emma ’17, and discovered that these days the post-service goodies are served up front by the altar. Right in church. It felt downright, dare I say it, sinful. It was the ecclesiastical equivalent of breakfast in bed. This casual snacking was a far cry from the coffee hours of our undergraduate days, when sherry was sipped downstairs in the same church in an air of great decorum. This then-and-now difference has me thinking about change, and how it isn’t necessarily a dirty word. (I’ll take cookies by the altar over sherry in cut glass almost any day.) To that end, here are some observations on the haves (have changed) and the have nots between the time we hung around Gambier as students in the 1980s and the day we drove Emma up the Hill. —Let’s get right to it: the luxury ocean liner of the Kenyon Athletic Center compared to the leaky barge that was Wertheimer Field House. Where Wertheimer looked like the kind of place soldiers drilled before shipping out, the KAC gives the impression of something that should have Jean-Luc Picard at its helm. Yet truthfully, I’m fond of the new building despite not undeserved criticisms of its cost and role in the greater Student Rec Centers arms race. Let’s face it: it’s a pretty cool space whether you’re a casual exerciser or a varsity athlete. Running around an indoor track without clipping your left shoulder on pillars at each curve? Bring it on. No, I’m fine with the KAC. What really galls me is the rise and fall of the Ernst Athletic Center, built in 1981 with a state-of-the-art swimming pool and workout facilities, then torn down in 2009. Nothing makes you feel old like realizing things that were new when you were young are gone, replaced by something even newer. —Coffee consumption. OK, we “borrowed” a lot of chinaware from Peirce in our day, carrying half-full cups of joe out after breakfast, lunch and/or dinner. But today? Java is absolutely everywhere on campus, whether obtained from Peirce or the Gambier Deli or Wiggin Street Coffee or some underground dispensary you need a student ID to enter. Everyone, from students to faculty to the weekend Amish vendors, seems to have a cup in her hand as she walks up and down Middle Path, to the point you wonder whether the containers are miniature battery packs powering people through their day. Don’t get me wrong: it’s a perk I’ve come to appreciate on visits. But it makes me question what a day without caffeine on campus would look like. Scenes from The Walking Dead come to mind. —Threading the Gates of Hell. Honestly, I don’t remember caring if a companion and I passed on opposite sides of that hitching post thingie the way students do nowadays. But talk about a no-no. I have the arm bruises from being hauled to safety just in time by Emma to attest that it’s a big deal. Sheesh — sorry! As for things that haven’t changed? —Newscope. In those blessedly screen-free days of yore, campus news and goings-on — the official stuff, anyway — was delivered thrice weekly to Peirce and (back then) Gund dining halls on actual sheets of paper. It was like a combination of email, Facebook and Twitter, except you could fold it into a paper airplane when you were done reading. Well, darned if Newscope isn’t still around, perched on tables in all its wood pulp-based glory. It’s a tad shorter than I recall, listing fewer events, but it’s a nice reminder that even as things change, they’re still able to be manipulated into hand-launched flying machines. —Dorm life. I’ll give you some of the fancy new places, the NCAs and a Morgan or two. But the old-school dorms — your Nortons and Bushnells — look pretty much the same now as when I was a lad. Thirty-five years later, the rooms haven’t magically expanded. The hallways are just as narrow. The furniture in the lounges looks the same: honestly, it may be the same. The design — Nouveau Army Barracks — is still fostering acculturation through mandatory proximity and hardship. Just the way we Wertheimer-era parents like it. —Pageantry. 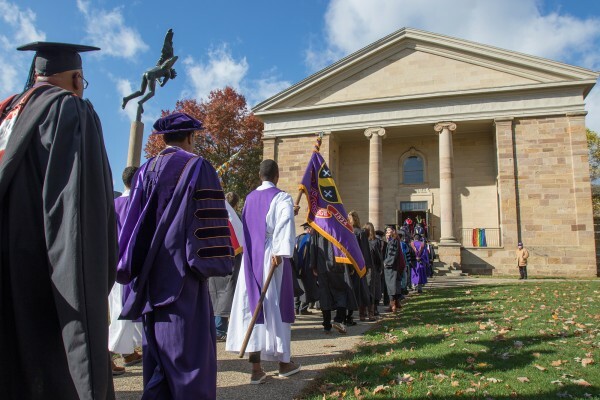 At Honors Day in April, I watched the faculty march into Rosse Hall wearing their robes, hoods and hats, looking for all the world like officiants at a mass Jedi wedding. Once upon a time I might have found the costuming silly, but not anymore. I felt both nostalgia and respect observing the professorate file inside, recalling the same parade from various ceremonies way back when. When telling people your daughter is a liberal arts major earns you looks usually reserved for abusive parents, the embellished duds are an affirmation of a path we chose with rewards greater than the diplomas handed to us at graduation. To those skeptics who decry the dressiness of such occasions as outdated and pretentious, I say: Hood me. And now, come to think of it, I’m going to grab one of those ubiquitous coffee cups. And fill it with sherry. Just for old times’ sake, you understand.